The parent teacher conference day scheduled for April 25, 2019 will be a full day of instruction for all middle school students. If at any time parents wish to discuss their child’s progress, they can call the guidance office and a counselor can set up a meeting. Parent teacher conferences will still take place as scheduled for elementary schools. Located on the east side of the city, East Middle School serves approximately 600 students each year. Our student-centered school ranges from 6th- 8th grade. We also serve the community through our school-based health care clinic. We are proud to be a neighborhood school in a community with a strong commitment to education and collaboration. 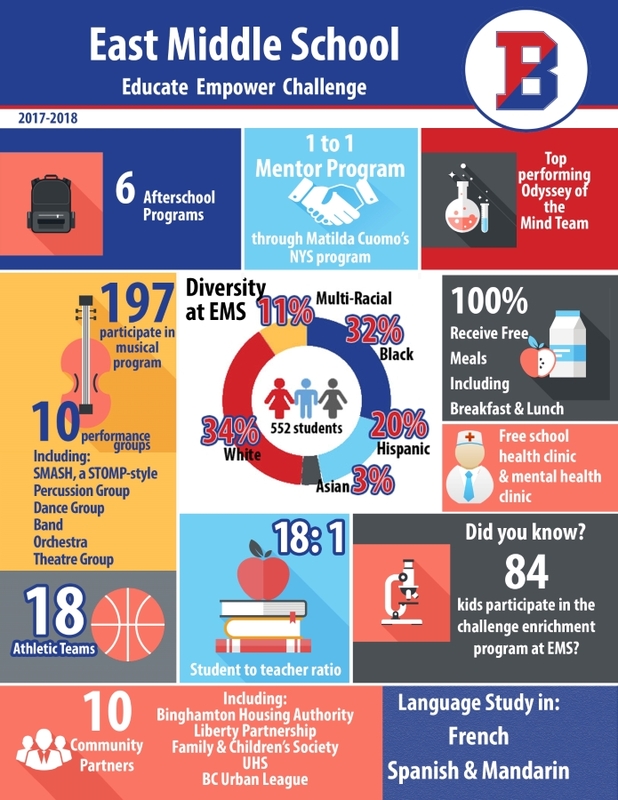 Just take a look at a number of items we have accomplished by clicking on the EMS Report Card on the right. Each and everyday EMS staff members work to build strong relationships with our students and parents. Our goal is to ensure all students have equal access to rigorous, high quality curriculum that is aligned to the Common Core Standards and delivered through challenging instruction. If you have any questions, or thoughts to share, please do not ever hesitate to contact us directly. Our door is always open. Thank you for your continued support of East Middle School.